We had an operator send these pictures from the back of a 13KV switchgear main breaker. Myself and a couple other techs were musisng over what it could be. Our guesses are everything from strip heaters to B phase CT. Any one ever see this before or have any good ideas. Thanks. Assuming those are temps in F and not C, I’d try to rule out a space heater first. Can you rack the breaker out and see what is happening on the other side of the wall? Never mind, probably not cold enough for 24F ambient temperature in the cable compartment. Temps must be in C.
Hypothesis: a heavily loaded circuit, single conductors through sheet steel encircling the conductor - could it be eddy current heating in the narrowest current-carrying section of the partition? Yeah that sheet looks pretty thin. 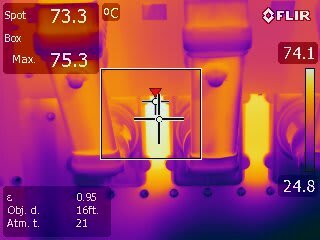 You could probably track down the heater breaker / fuses for the cubicle and rescan with the IR cam and the heaters off to confirm. The SWGR looks relatively new. Have you checked the manufacturers drawings for heater location? Bad contact in one or more "tulips" due to manufacturing defect? A space heater cannot put out that much hest. What happens when the breaker is off? Could those be Voltage transformers - may be Bus VTs mounted on withdrawable truck?? Induction heating of the ground busses by heavy, adjacent phase currents. There must be components and/or sheet metal masking the source of the heat for it to be so sharply delineated. I can't imagine it being anything BUT induction heating. Fits with slight non-symmetry as compared to the other side and they'd never mount anything between those two feed-throughs as there'd be bolt holes if they had. Very interesting, I didn't realize inductive heating could be so dramatic. Here is an article that discusses the effect and includes some photos. (mistakenly) are not part of the normal infrared survey. deterioration of other substances in close proximity. grounds, and high impedance faults. That looks the isolated phase bus duct between a generator and it's step-up transformer. The scaffolders at our power station did something similar, making a closed loop around part of the IPB for a 300MW generator with nearly 16kA flowing in the bus. He formed the loop outside of the cross-bonded section where there's no image current cancellation effect. The report was that the tube got hot enough to burn his hand, and when he jolted it there was a blue spark. Poor guy was pretty shaken by the experience. They'd gone a bit higher up than they should have, trying to get ahead on the job. As ScottyUK suggested, a closed loop of steel around a conductor can flow a lot of current - it basically creates a 1-turn transformer. I once measured about 250A flowing through a unistrut completing the circuit around a conductor with 2500A flowing. Considering that it's likely 1200A or less @ 50Hz or 60Hz just passing by, I would put more belief in the above than in believing the current in the bar is inducing eddy currents that only circulate locally inside that strip of steel. It might contribute, but I find it hard to believe it's solely responsible for that much heat. It's odd the manufacturer wouldn't know this happens. The similar pass-through location from Schneider has one big insulator for all 3 breaker bus stabs to avoid that exact problem. It doesn't have to be encirclement or a closed loop. In Keiths top left picture, the intruding bar or pipe is hottest in the area of the strongest flux. This suggests local eddy currents. This effect may also be present in non-ferrous material. An AC flux will induce a potential with the resulting eddy currents in any conductive material. It is, of course, a much stronger effect with a ferrous material forming a magnetic core. If the current was caused by a closed loop the same current would circulate in the loop and the entire loop would be hot. I would expect the bus in Keith's first pictures flows A LOT more current than the bus in the OP's enclosure so I could believe local induction there more so than the OP's picture. However, without seeing the whole structure it's hard to know if that bar forms a closed loop or not. Structure that acts as a heat sink at each end of that bar can explain why its the hotter in the middle. Same with the enclosure picture, no-one can say if there is a loop around a single phase or 2 phases of bus from the picture. I ScottyUK's hypothesis above regarding the OP's pictures. I suspect the design called for a stainless steel plate here, but a steel plate was mistakenly used during assembly. Thanks for all the input guys, I haven't heard back any word on this as of yet. I am currently at another substation for metering upgrades but will try and get some more info and answers to post back here. I looked at this again and I have to agree with Scotty's suggestion. the cable is not encircled by magnetic material. Aluminum, Stainless, Micarta or, my favorite for field builds, a hacksaw cut between the openings. Quick, cheap and easily done in the field. Despite the intense colour, 73 degrees C is probably not enough to burn the paint off or cause rapid heat corrosion of parts. In severe instances I have seen the paint burned off of an enclosure and have seen rapid heat damage of equipment. 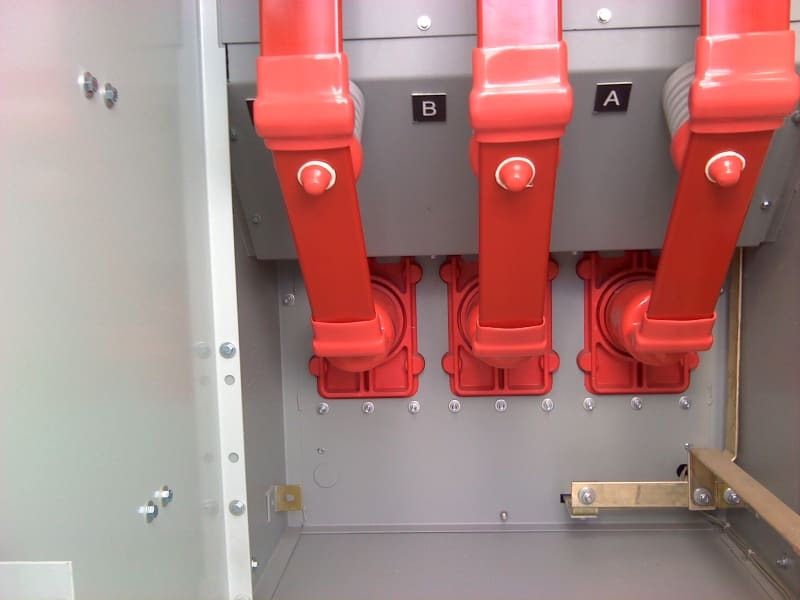 eg: A 400 Amp rated disconnect carrying less than 200 Amps with unbalanced loading in the multiple steel conduits feeding the switch. The steel conduits became very hot and the copper conductors conducted the heat to the switch blades. Heat corrosion destroyed the switch blades. This case is not nearly that hot. But if the current increases close to or above around 200 Amps, you may have problems. With a ferrous material the heating is from a combination of magnetic hysteresis, eddy currents and the ferrous core. With a non ferrous material there will still be eddy currents but with the absence of a ferrous core the effect will be orders of magnitude less. Inductive heating does not only work with ferrous material.